The Democrats are working on a new budget proposal to counter Congressman Paul Ryan’s budget that was unveiled last week. Rep. Chris Van Hollen says House Democrats’ plan also would reduce the federal deficit. But he says it would preserve Medicare. Van Hollen criticized the Republican budget released last week as giving tax breaks to millionaires and ending the Medicare guarantee. The Hill newspaper says the Democrats’ plan would cap overall discretionary spending at the levels set by last summer’s debt-ceiling deal, even though some on the left of the party say that’s too restrictive. And The Hill says that House Democrats may support the alternative plan, despite some deep reservations. The House will take up the 90-day transportation stopgap measure during a special vote today. The bill will need two-thirds vote to approve it. Republicans think the vote might fail. Politico says the Republicans would need dozens of Democratic votes despite their vocal opposition. But delays would also open Democrats to Republican criticisms that they voted for a shutdown. DOT programs and the gas tax expire Sunday without congressional action. The Senate would also need to clear a stopgap this week. In a change of administration, focus on certain appointees first. That’s the message from a new bipartisan recommendation. The Aspen Institute-Rockefeller Foundation Commission to Reform the Federal Appointments Process panel says Congress and the next president should do everything possible to vet, nominate and confirm appointees to the government’s 100 to 150 “most time-sensitive” positions by May 1 of the new term. That’s a tight window but the panel says lengthy delays in the Senate confirmation process — due in large part to politics and legislative tactics — leave agencies operating at less than full power and discourage qualified individuals from entering public service. The Postal Service is taking aim at what it calls a flawed study of its revenue streams. Government Executive says that the report, commissioned by Postal Service, estimated that service cuts included in the Postal Service’s business plan would result in $5.2 billion in lost revenue for the first year of implementation. The Postal Service says the survey is flawed because it “asks respondents about a scenario that would never be implemented at the same time.” The Postal Service is sticking to the savings and costs estimates from its five-year business plan over the new survey. Two workers at the Department of Veterans Affairs have been suspended for violating the Hatch Act. That’s the law that prohibits feds from being involved in politics while at work. The two workers admitted to using their work email accounts to campaign for then-candidate Barack Obama back in 2008. The Office of Special Counsel [PDF] says they did that, despite daily reminders from the agency about the Hatch Act and its restrictions. One employee served a two-week suspension; the other served three weeks. Read about the Hatch Act from the Office of Special Council. Meanwhile, there have been calls to reform the Hatch Act. And it’s a big day at the U.S. Supreme Court today. The high court is opening up oral arguments in what many longtime court observers are calling the biggest case of our generation. The case calls into question the constitutionality of the President’s Affordable Care Act. We have a number of resources. The Washington Post has background on the provisions that are in question — and the arguments… and a guide to the oral arguments that are going on. And Politico has five things you need to be on the lookout for… like what role politics plays in the decision… and six potential endings to this story. Is your Facebook profile off limits during job interviews? There have been reports of interviewers asking for the Facebook password of potential job hires. The Washington Post says, two U.S. senators have asked Attorney General Eric Holder to investigate whether employers asking for Facebook passwords during job interviews are violating federal laws. Democratic Senators Chuck Schumer and Richard Blumenthal also want the Justice Department and the Equal Employment Opportunity Commission to launch investigations. The senators are sending letters to the heads of the agencies. As budgets across government are getting slashed one area is actually seeing growth — cybersecurity. The federal Chief Information Officer Steven VanRokel has said that cybersecurity is one of the Obama Administration’s top five information technology priorities. But not everyone agrees that a cyber war is near. Thomas Rid [@ridt] is a professor in the Department of War Studies at King’s College London. He specializes on on irregular conflict and new technologies, cyber-security, and the theory of conflict. He has written a piece in Foreign Policy magazine headlined, Think Again: Cyberwar: Don’t fear the digital bogeyman. Virtual conflict is still more hype than reality. From the DorobekINSIDER archives: 06.09.2010: DorobekINSIDER: Is cybersecurity over-hyped? 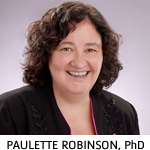 Do we need Chief Information Security Officers? We spend a lot of time talking about doing more with less, but state and local organizations have been doing that for years. And one area where some are cutting: chief information security officers. What are the potential ramifications? Hord Tipton is the executive director at ISC2 . He told me why this is happening. On GovLoop: Is your Chief Security Information Officer really necessary? Space is getting too crowded with junk. The Christian Science Monitor says six astronauts aboard the International Space Station – including two Americans, orbiting 200 miles above the planet — were told by ground control to scramble into two docked Soyuz spacecrafts in case a piece of a wrecked Russian satellite should smash into the ISS, which could have heavily damaged the platform as both objects were traveling at 17,500 miles per hour, which is the speed in orbit. The emergency was called off after the chunk passed by at an approximate distance of nine miles – which in space terms is a near-miss. NASA says there are about 22,000 pieces of sizable space junk – primarily bits of old satellites. 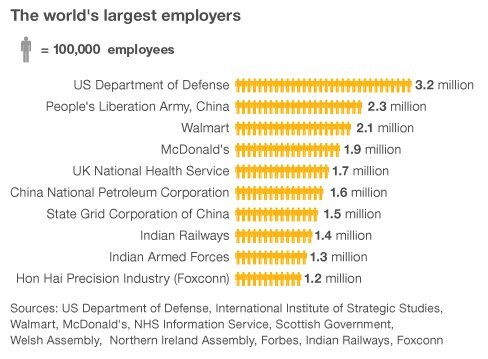 What is the world’s biggest employer? Anyone? Anyone? There is a big debate in Great Britain about health care — sound familiar — and some have that the Britain’s National Health Service is often billed as the third biggest employer in the world, after the Chinese army and Indian Railways. It’s an incredible claim, given how much smaller the UK is than China or India. The BBC did some fact checking. And indeed, it is not true. Sizing up the world’s biggest employers and compiling a list of the top 10, the UK’s National Health Service comes in at number five with 1.7 million workers across England, Wales, Scotland and Northern Ireland… Number four is McDonald’s — although they note that 80 percent of the restaurants are franchises so, strictly speaking, 1.5 million of these people are employed by other companies… number three is Walmart with 2.1 million employees… Number two: The People’s Liberation Army in China… 2.3 million people… but topping the list, the U.S. Defense Department with 3.2 million people.